"Did you know that the best source for cheap bridal gowns is to go to charitable organizations that run thrift stores?" Some stores you may be familiar with are Goodwill Thrift Stores, Salvation Army Thrift Stores, Childrens Hospital Thrift Stores and others. Of course, if you buy a bridal gown from one of these sources it may or may not be in the best condition. Most often, the gown will be out of style. This is good if you are looking for a vintage wedding dress, from another era of time. You can also think about having the gown redesigned to look more like a modern wedding dress. "Sometimes just little changes like removing sleeves and reshaping a neckline will update a dress." Also the bridal dress will need cleaning and/or repair. So inspect the dress carefully before you purchase it. Make sure the dress fabric is in good condition. Sometimes fabric will start to deteriorate and dry rot. This will happen most often with the attached petticoat. The petticoat can be cut out and replaced if the outer fabric is in good condition. Check the threads of the seams to make sure they are strong. If the threads arent strong you will have to have someone re-enforce every seam. This could turn your cheap bridal gown buy into a money pit. So it would be best not to buy a dress that need all or most of the seams reinforced. If the gown has stains that you are not sure will come out . . . dont purchase it. If you do buy it . . . try not to pay much for it. 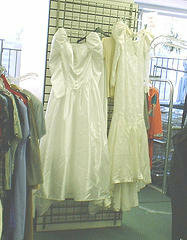 Take it to a dry cleaners that specialize in cleaning and restoring wedding dresses to see what can be done. Again spend as little as possible on the gown. If you find that the stains wont come out, you will not have invested much in the dress. Also most likely your gown will need to be cleaned so check before hand to see how much a general cleaning of a wedding gown will cost you. Just a cleaning and pressing of your gown , depending on where you live, can cost anywhere from about $100 to $250. It your gown needs to be restored back to the original color because of yellowing, the cost usually start at $200 to $300. "So when looking for cheap bridal gowns . . . consider dresses donated to charitable organizations to find good deals!" I happen to come across this resource with information of how to clean vintage clothing. Go to www.fashion-era.com for tips on how to clean vintage wedding dresses. 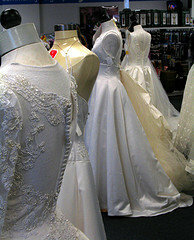 Learn what you need to look out for when buying authentic used vintage wedding dresses. Borrowing a second hand wedding dresss from family and friends is the ultimate cheap wedding dress find. Knowing what to consider before you go this route will help you decide if this the way to go.